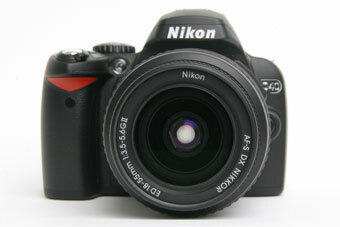 I've put together this Nikon D40 guide to give you an introduction to this user-friendly camera. As many more comsumers make the transition to a digital SLR expect to see more cameras like the Nikon D40: ones that bridge the gap between standard compact point-and-shoots and the more advanced SLRs. When it comes to guidance, the Nikon D40 delivers - I'll tell you all about it's innovative help system as you read through this guide. The key feature of the Nikon D40 that sets it apart from other digital SLR cameras is its informative LCD screen. Press the INFO button on the camera, and the LCD displays all of the camera settings: Shutter Speed, Aperture, ISO, Image Quality, White Balance, Autofocus Mode, Remaining Photos on Memory Card and Battery Status. Since every other digital SLR also displays these settings, the Nikon D40 does it with a twist: the LCD actually SHOWS you what these camera settings mean. Take aperture for example: aperture is the width of the opening in the camera's lens and indicates how much light the lens is letting into the camera. Aperture is very confusing for many beginning photographers because it's the reverse of what you'd expect: a smaller aperture number is really a wider aperture. But the Nikon D40 makes this completely obvious. Take a quick look at the display on the LCD and rather than just an aperture number, you'll see a graphic representation of the aperture setting. As you turn the camera's control dial to change aperture, you'll see the opening widen and narrow. This visual cue about the size of the aperture makes it significantly easier to see that 5.6 is a wide aperture while 16 is narrow. The Nikon D40 is a great camera for beginning photographers. The LCD not only shows you how a particular camera setting will affect your photo, it also pops up helpful hints to alert you when your photo won't turn out. 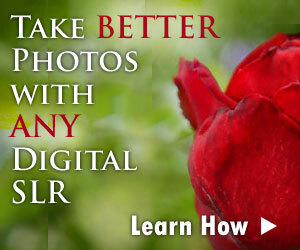 This is the only digital SLR that will tell you that the image is too dark (use the flash!) or that the battery has run low. Despite this lack of buttons, the D40 is VERY easy to use - making it easy for beginning digital SLR photographers to change camera settings without feeling completely lost. In addition to its helpful tips for beginners, the D40 is very compact and light. In order to write this Nikon D40 guide, I toted the camera around with me every day for a couple of weeks and barely noticed the camera was there. The D40 is not only the smallest and lightest Nikon SLR camera you can buy, it's also a contender with the other small-sized digital SLR cameras made by Samsung, Canon and Pentax. Put another way, if you think that you want to make large prints, or you imagine using your SLR a lot in low-light or dusty conditions, then it's probably worth your while to investigate some of these other alternatives. If you don't think that you'd really leverage these extra features, and are just getting started in the world of digital SLR photography, then the D40 is going to be your best bet. If asked to sum up this Nikon D40 guide into two words, it would be these: easy and compact. It's incredibly easy to change the camera settings on the D40, even if you are not a seasoned user of digital SLR cameras. The camera is so small that I found myself using it a lot more like a compact digital camera than an SLR: taking shots with one hand at arm's length. Without an LCD preview this led to a high number of botched photos (autofocus was off), but the D40 lends itself to this type of one-handed from-the-hip style of photography. 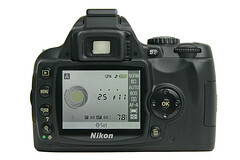 As I mentioned previously in this Nikon D40 guide, the LCD display is the selling point of this camera. To begin with, it's a big, bright 2.5 inch display that is easy to see even from high and low angles (you don't have to peer at it head-on). The size of the LCD is not unique - there are plenty of other digital SLR cameras with 2.5 inch LCD screens. What is unique is the INFORMATION that the Nikon D40 displays. 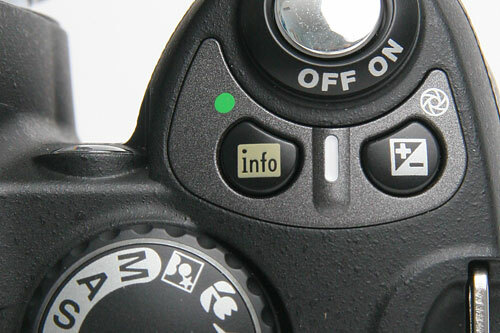 When you press the INFO button (located on the front of the camera near the On/Off switch and shutter release button) the LCD shows you all the camera settings at once. On the left-hand side of the display there is a circle, which is a graphical representation of both shutter speed and aperture. The aperture display here is the real asset: it clearly shows you the width of the lens aperture based on the aperture setting. With an aperture of f/3.5 the graphic shows you a wide circle, and with an aperture of f/16 it shows you a narrow circle. This takes all the guesswork out of trying to remember if an f/3.5 aperture is wide or narrow (a common problem with photographers getting started with SLR cameras). The shutter speed graphic is less obvious: it reads more like a pressure guage that surrounds the aperture circle. As shutter speed increases, more segments appear on the guage. Surrounding this graphical display are all the rest of the camera settings: battery life, ISO, number of shots left, image quality, etc. Any one of these settings can be accessed by pushing the help button on the back of the camera. It's nice enough that the D40 shows you the aperture/shutter speed graphic. But the D40 takes this graphical approach one step further with all of the camera controls. Let's take ISO: rather than making you guess what ISO is useful for, the D40 SHOWS you. Small thumbnails photos accompany each ISO setting - all you have to do is match the actual scene in front of you with the thumbnail, and your ISO setting will be correct. This same approach is applied to every other camera setting you can change from the INFO screen. While this graphical approach to camera settings will certainly help the beginning photographer it also makes the Nikon D40 incredibly easy to use. To change any camera setting, you just press the INFO button followed by SETTING button. Voila! You can now adjust and tweak each camera setting until you get them just right for the lighting conditions and your choice of subject. 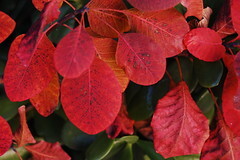 Like other Nikon digital SLR cameras (including the D50 and D70s) the D40 captures vivid colors. The D40 also has a feature that is NOT shared on the D50 and D70s: the ability to take photos in black and white. The monochrome option is available from the color settings menu, which also includes Standard, Softer, Portrait, Vivid, Vivid+ and Custom. Adjusting the color settings can really have some interesting effects on your photos, especially the Vivid+ mode, which enhances colors — great for Fall foliage, but not so good for an intimate portrait. Unlike many other comparable digital SLR cameras, the Nikon D40 uses a simple 3-point autofocus system (most other cameras in this class have 5) where the 3 focus points are aligned straight across the viewfinder. While this might be a drawback for the dedicated action photographer (who needs more focus points to track a fast-moving subject) I did not have any autofocus issues as I was testing the camera for this Nikon D40 guide. Perhaps keeping it simple was the right way to go, because the autofocus is very fast and quite precise. The autofocus does have a hard time settling in under dim lighting conditions and when the subject is monochromatic (with little edge definition) but this is true of many other digital SLR camera models. Under normal lighting, the Nikon D40 focuses in an instant, resulting in very few missed photo opportunities. 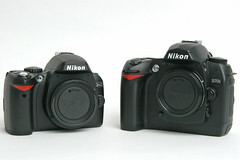 The Nikon D40 uses the compact EN-EL9 rechargeable lithium ion battery, which is smaller and lighter than the standard EN-EL3e used in the Nikon D50, D70 and D70s. Despite its diminutive size, the battery holds a charge quite well, and lasted up to about 300 shots before finally giving out (under normal use conditions). We now arrive at the part of this Nikon D40 guide where I talk about the only major drawback this camera has: its compatibility with lenses. In their efforts to reduce the size of the camera body, Nikon eliminated a focus motor. This motor is used to drive the autofocus mechanism of many of the older Nikon F-mount lenses. Since this is the case, the D40 is only 100% compatible with lenses that bear the AF-S or AF-I designation, since these lenses have their own internal autofocus motors. Here's the key: autofocus won't work with any lens that is not AF-S or AF-I. Yes, you can attach ANY F-mount lens to the Nikon D40 (the lens mount is still the same) but you'll have to make do with manual focus with all of these lenses. Bottom line: you'll have less lenses to chose from if you decide to get the D40. For the beginning photographers this camera is aimed at, this should not be a big issue (since it's more advanced photographers who want to change lenses all the time). But it does mean that you won't be able to use autofocus with many third party lenses that can be cheaper alternatives to the Nikon AF-S lenses. The kit lens that ships with the Nikon D40 is the 18-55mm f/3.5-5.6G ED II AF-S DX zoom. This zoom range is fairly common for a kit lens, and works great for landscape and portrait photographers. The wide angle of view at 18mm really helps when you're trying to capture the entire scene in front of you. The real plus here is related to the limitation that I just described: AF-S. Since AF-S lenses have their own built-in focusing systems, they focus in an instant and they are dead quiet. I believe that the AF-S lens has a lot to do with the apparent speed of the D40 camera itself - you can point the camera at a subject, focus and take a shot all within a matter of seconds. AF-S lenses are also great for photographers who like to be discreet (or who take photos in quiet museums) since everyone around you doesn't have to listen to your autofocus sytem grinding away. If you'd like to get a different (or additional) lens for the Nikon D40, I've put together a 6-step guide to help you find the best digital SLR lens. The Nikon D40 is competitively priced against other 6 megapixel digital SLR cameras, and its ease of use is a real advantage relative to the competition. There are a few cameras that are cheaper, including the Olympus E-500 which has a slight advantage when it comes to megapixels: 8 instead of 6. The D40 is comparably priced with the the Pentax K100D. The biggest difference between these two competing cameras is that the Pentax includes built-in anti-shake which works with every Pentax lens you attach to the camera. While you can get anti-shake with the Nikon D40, you'll have to purchase a special lens with Vibration Reduction (VR) and these lenses are fairly expensive. Right out of the box, you're going to need a digital SLR memory card - the standard Nikon D40 kit doesn't ship with one. The tiny postage-stamp SD memory cards used by the D40 have a wide range of storage capacity. I have found a good balance between price and performance with the SanDisk Ultra II series of memory cards (both Compact Flash and SD varieties). There are several different sizes of Ultra II SD cards, including a 512 MegaByte, 1.0 GigaByte and 2.0 GigaByte. My personal favorite is the 1.0 GigaByte card with a built-in USB connector. With this card, you won't have to purchase a separate memory card reader, you can just plug the card straight into your computer's USB port. To do any one of these, you're going to need two essential accessories: A tripod and a remote camera trigger. The remote triggers lets you take photos from a distance without ever touching the camera. 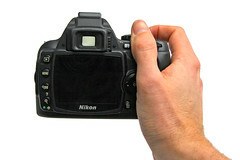 The D40 uses the same remote trigger used by the D50 and D70: the ML-L3 wireless remote. This section of the Nikon D40 Guide is for people who already own this camera. I've put together the following links to help you find more information and support for your D40 camera, in case you run into problems. Forums are a great place to share ideas with other like-minded Nikon owners, or to get specific questions answered about how your camera works.